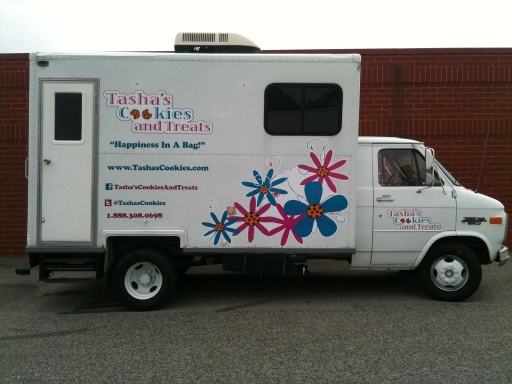 Tasha’s Cookies and Treats is a dessert truck serving traditional cookies like chocolate chip pecan, oatmeal, sugar, and other varieties as well as cake-like sandwich cookie flavors like red velvet, carrot cake, sweet potato, German chocolate, and banana nut. As they expand, they may also include other dessert offerings on the truck. The serving area is Montgomery County, MD and they launched on Sept 16, 2012.